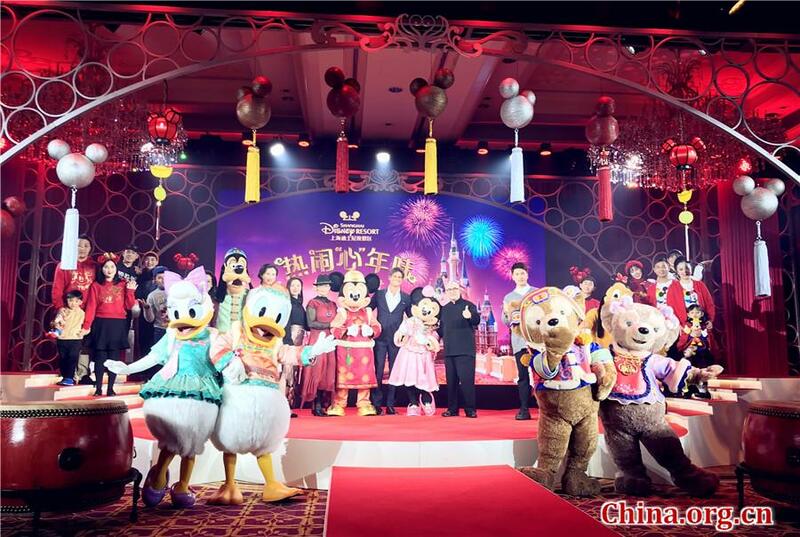 Shanghai Disney Resort unveiled its entertainment programs planned for the 2019 Chinese New Year, also known as Spring Festival or Lunar New Year, at an event held in Shanghai on Jan. 15. The resort will present a series of special activities plus holiday foods and merchandise following the theme of Spring Festival, China's most important holiday, from Jan. 19 to Feb. 19. The festivities will feature Disney magic, Chinese festive traditions and Shanghai culture, allowing visitors to experience a unique fusion of Western and Eastern perspectives. At the unveiling event, a host of celebrities gathered to share their own Chinese New Year memories and traditions, including Pan Hong, an actress and movie star from Shanghai, pianist Kong Xiangdong, Olympic sailing champion Xu Lijia, fashion designer Ji Cheng and Sun Dou'er, the male lead performer of the Mandarin musical production of "Beauty and the Beast." To embrace the coming Year of the Pig, the hilarious pig from the Toy Story films will appear throughout the resort, signifying good luck and fortune. In the Garden of the Twelve Friends, the pig zodiac will also be adorned with golden coins and red Chinese couplets. In addition, visitors will see red and gold Mickey lanterns, floral garlands, peach blossoms and traditional Chinese paper cuts. Besides the general atmosphere of the Spring Festival, visitors will also get a taste of Shanghai culture. During the festival period, Disney characters Mickey, Minnie, Donald and Goofy will appear dressed in traditional Chinese attire and perform Shanghai Swing, an entertaining dance featuring vintage Shanghai-style costumes in a high-energy show that encourages guests to participate as well. Actress Pan Hong, who recorded the Mandarin voiceover for the "Once Upon a Time" Adventure in the Enchanted Storybook Castle, is helping spread the holiday spirit this year with the release of the first-ever Shanghainese narration of the attraction's opening scenes. January will also see the roll-out of an all-new Mickey in Shanghai travel collection—the latest addition to the popular Mickey in Shanghai merchandise line unveiled in late 2018. The new collection features classic images of Mickey and Minnie Mouse alongside reflections of Shanghai's iconic landmarks, popular local snacks and distinctive phrases. As they take it all in, guests can also sample a themed buffet or family-style feast, write a New Year wish on a wish card, buy New Year gifts and enjoy the special Spring Festival fireworks display, called "A Feast of Love and Light." Shanghai Disney Resort opened in June 2016 and is the largest Disney park in Asia.